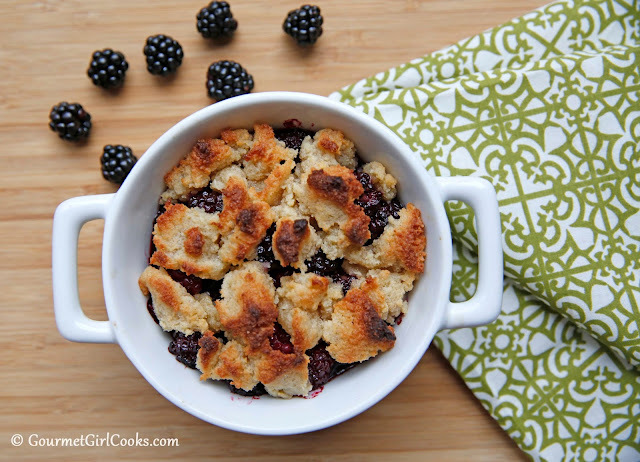 This evening I wanted to make a quick and easy dessert using the beautiful fresh blackberries I had. 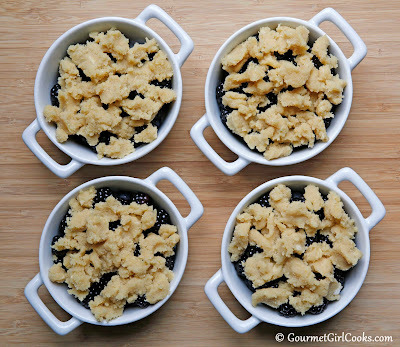 I decided to make Blackberry Crumble. It turned out absolutely delicious and the topping was awesome. 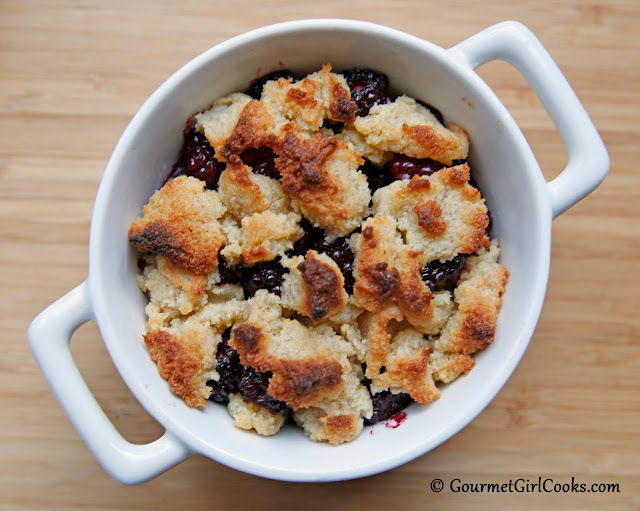 A crumble is not really a crisp or a cobbler, but somewhere in between. 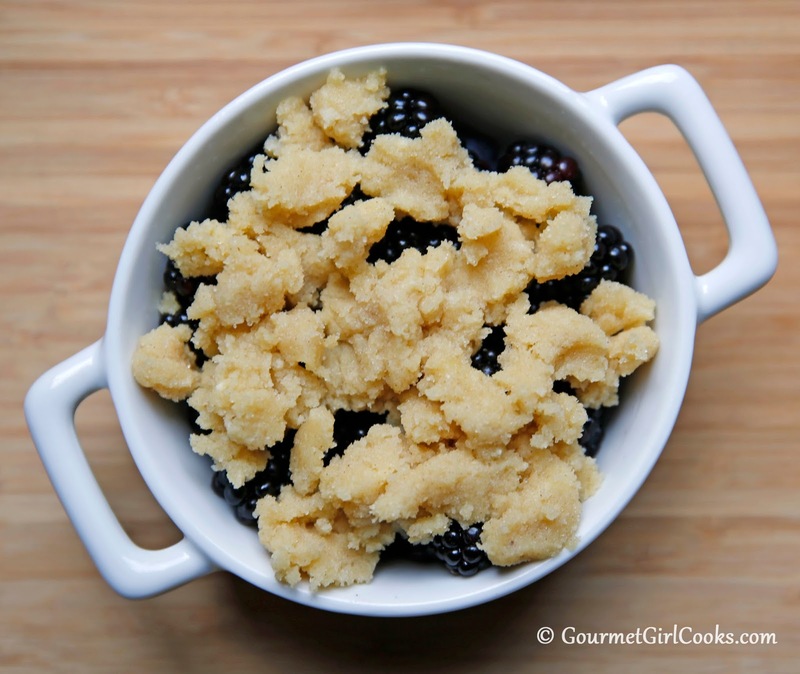 This crumble uses very few ingredients and only takes a few minutes to put together and pop into the oven. I served mine warm topped with whipped cream but it would also be delicious with sugar free vanilla ice cream or frozen yogurt, too. 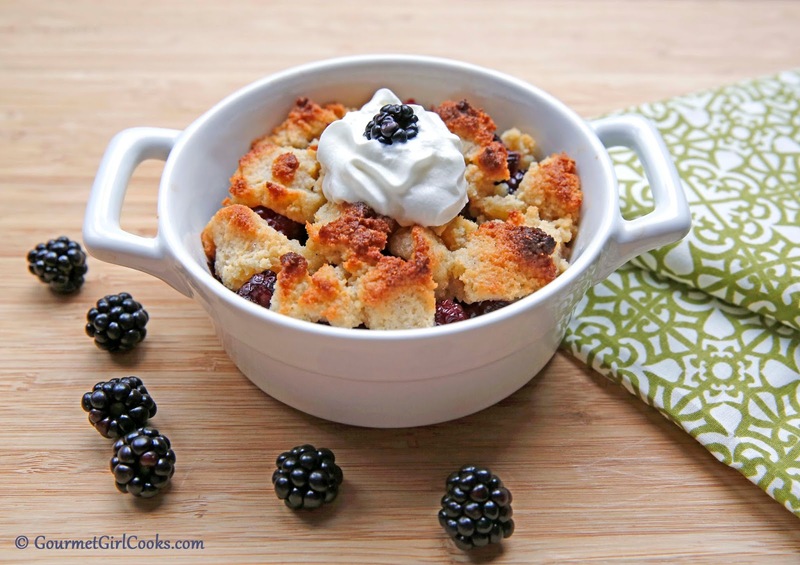 The topping is similar to cookie dough when mixed together and is dropped on top by rubbing between your fingers and dropping in little loose clumps on top of the berries, then baked. 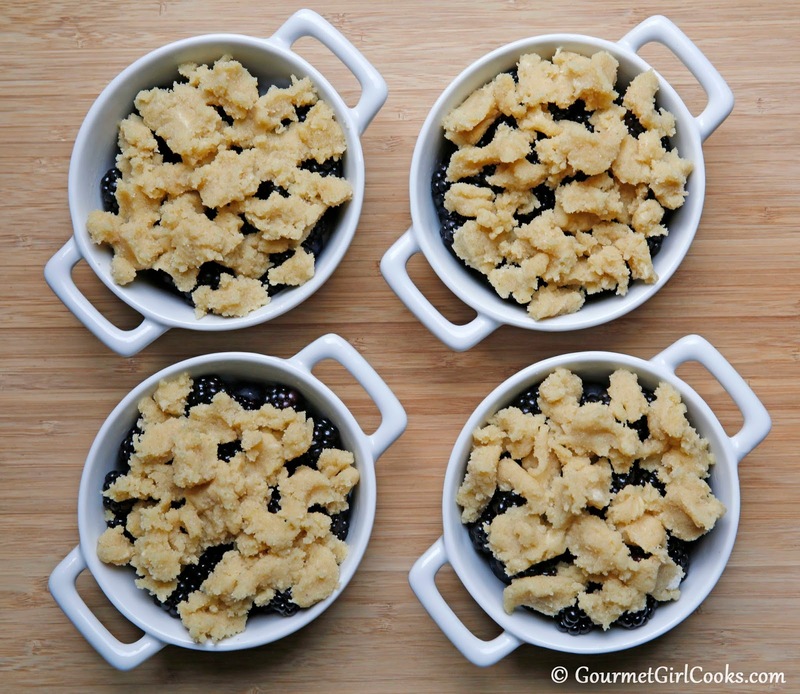 This method produces crispy chunks of a pastry like textured topping when baked. I baked mine at 350 degrees for about 25 minutes and then reduced the heat to 325 degrees and baked an additional 10 minutes so it wouldn't brown too much (check for browning after about 20 minutes so it doesn't burn). I snapped some photos below and included the easy peasy recipe. You could swap out the blackberries for other berries or use a combination of berries if you'd like. I did not sweeten the berries, only the topping. If you like a sweeter crumble, you can add a little sweetener to the berries if you want. Enjoy! Preheat oven to 350 degrees F. Divide blackberries and place in 4 lightly greased 8-ounce sized ramekins or a lightly greased 11" x 7" casserole dish. Using a pastry/dough cutter, in a medium bowl, cut flour, sweetener, cinnamon, butter and egg until crumbly and combined (it will have a similar consistency to cookie dough). 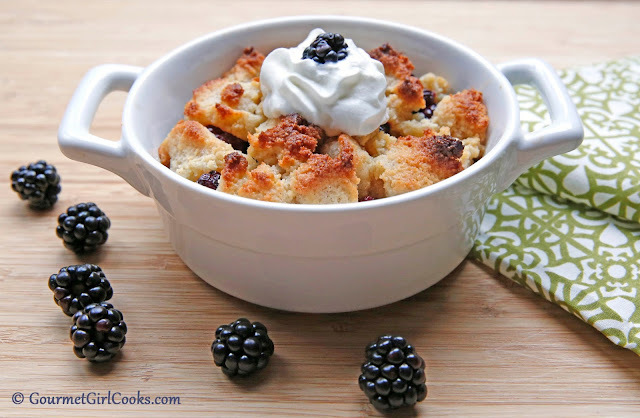 Using hands, drop and scatter bits and clumps of dough (rubbing between fingers) on top of blackberries. Bake for 30 to 35 minutes or until golden brown and bubbly (reduce heat to 325 degrees if it begins to brown too quickly). Let stand about 15 minutes. Serve warm topped with vanilla ice cream or a dollop of whipped cream, if desired. Refrigerate any remaining leftovers. 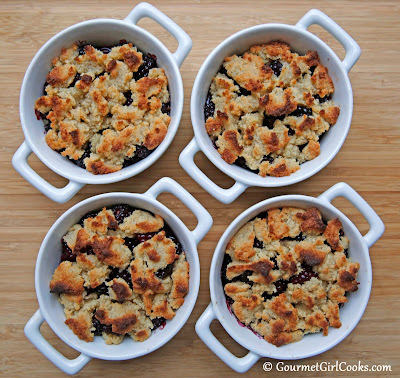 This looks terrific.....I'm going to make it with blueberries as I have a bunch to use up. Thanks for sharing your recipe.